The family includes species with socially monogamous and polygynous mating systems. Monogamous pairs of catbirds defend an all-purpose territory. 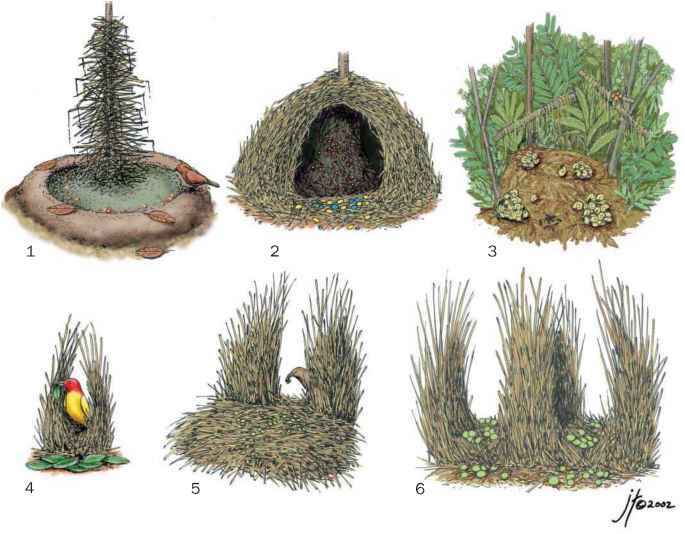 Males do not assist with nest building, incubation, or brooding of nestlings (which they do feed). The promiscuous males of the 17 polygynous bowerbirds defend only the immediate area of their bowers. A seasonal hyperabundance of fruits permits promiscuous males to spend inordinate amounts of time at their courts, in attracting/ courting females, while also permitting females to nest and provision their offspring unaided. 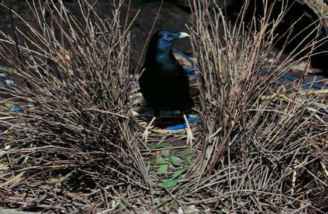 Male bowerbirds decorate courts and bowers with items such as leaves, flowers, fruits, lichens, beetle wing cases, insect skeletons, tree resin, snail shells, bones, river-worn pebbles, and specific parrot tail feathers and nuptial plumes of adult males of certain birds of paradise. Charcoal, glass, and innumerable other man-made objects may also be used. Males of some species manufacture and apply paint to bowers, even holding a wad of vegetable matter in the bill tip to use as a tool to apply paint. Because of this complex behavior, bower-birds have been associated with high intelligence and artistic abilities. Courts and bowers are critical to male reproductive success in the polygynous species. They provide a focal point to which males attract females for courting and mating. Adult males of most species average 50-70% of daylight at their bower sites. Activities at bower sites involve vocalizations (advertisement song and other calls, including mimicry), bower maintenance (building, decorating, painting), display, and chasing unwanted conspecifics away. Rival males damage each others bowers and/or steal favored decorations, in so doing improving their own chances of attracting more potential mates.